Centrist candidate Emmanuel Macron has decisively won the French presidential election, projected results say. Mr Macron defeated far-right candidate Marine Le Pen by about 65% to 35% to become, at 39, the country’s youngest president, the results show. A bitterly fought election concluded on Sunday amid massive security. Mr Macron’s supporters have gathered to celebrate in central Paris. 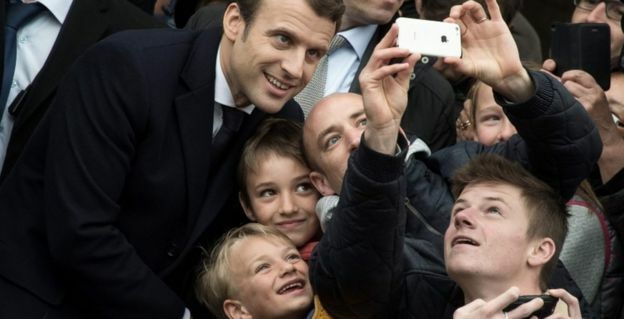 The BBC’s Hugh Schofield in Paris says this is the most remarkable success story of how a man who three years ago was utterly unknown to the French public, through sheer self-belief, energy – and connections – forged a political movement that has trounced all the established French political parties. What does Mr Macron stand for? He left the Socialist government of President François Hollande last August to form his new movement – En Marche – saying it was neither left nor right wing. Often with Emmanuel Macron one fears that (in a way that is very French) it is words that are doing his work. Words that are bridging the divides; words that are flattering his opponents; words that create the devotion that, among some, he inspires. In the campaign it became a joke among journalists how often his answers included the words “au meme temps” (at the same time). It was his way of marrying everything and its opposite, of reconciling every contradiction. What will be his immediate difficulties? Well, his En Marche grouping has no seats in parliament at all. Legislative elections follow on quickly from the presidential poll – on 11 and 18 June. En Marche will contest the elections as a party but Mr Macron may find himself needing to pull together a coalition to govern effectively. Although his presidential candidacy had support from other political parties, much of it stemmed from the need to defeat Ms Le Pen. He will need to win over the abstainers and those who are sceptical about his political vision. Left-wing voters in particular felt disenfranchised by the choice of the final two candidates. Mr Macron will also need to tackle the fallout from a hacking attack on Friday, the final day of campaigning, when a trove of documents relating to his campaign, said to include both genuine and fake documents, was released online.